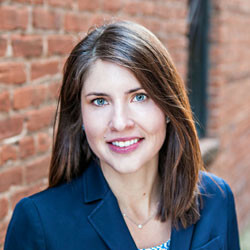 Elizabeth started her legal career at a large, well-respected international law firm in Atlanta before developing deep bankruptcy and insolvency-related expertise as a long-time law clerk to the Honorable Mary Grace Diehl in the U.S Bankruptcy Court for the Northern District of Georgia. Following her six-year clerkship, Elizabeth returned to private practice prior to co-founding Caiola & Rose. Elizabeth’s practice consists of litigating in bankruptcy, state and federal courts and providing business counseling. In bankruptcy proceedings, her practice focuses on representing the rights of franchisors, commercial landlords, and service providers as secured creditors, unsecured creditors, asset purchasers, and parties in adversary proceedings. Additionally, she litigates and provides counsel on a variety of franchise, real estate, and business disputes. Elizabeth couples her expertise with a problem-solving approach to get results. In addition to her legal practice, Elizabeth serves on the national board of directors for Youth Villages, a non-profit organization serving needy families and children aging out of foster care. She is also an Advisory Board Member for the Emory Bankruptcy Developments Journal, a member of IWIRC (International Women’s Insolvency and Restructuring Confederation), and a University of Notre Dame Monogram Club Member (Two-time Captain and All-American for the Women’s Varsity Swimming & Diving Team). Co-author of Protecting Real Estate Rights When the Franchise Relationship Ends, 37 Franchise L.J. 553 (Spring 2018). Co-author with the Honorable C. Ray Mullins: Perfectly Clear or Clear as Mud? : A Review of Selected BAPCPA Consumer Issues, Norton Annual Survey of Bankr. L. Part II § 1 (Aug. 2008). Chocolate, Flowers, and Section 363(b): The Opportunities for Sweetheart Deals Without Chapter 11 Protections, 23 Emory Bankr. Dev. J. 249 (Fall 2006). American Bar Association Forum on Franchising. International Franchise Association Legal Symposium. Georgia & Atlanta Bar Association – Bankruptcy Law & Franchise Section CLEs.